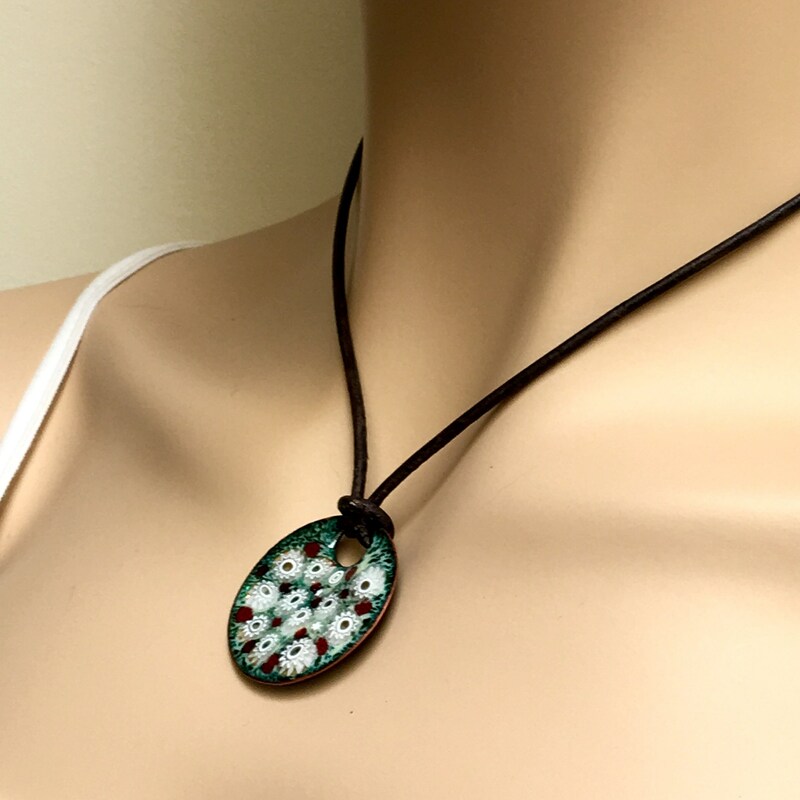 One of a kind copper enameled art pendant, glass on copper enamel design inspired by fresh white flowers in a green field. 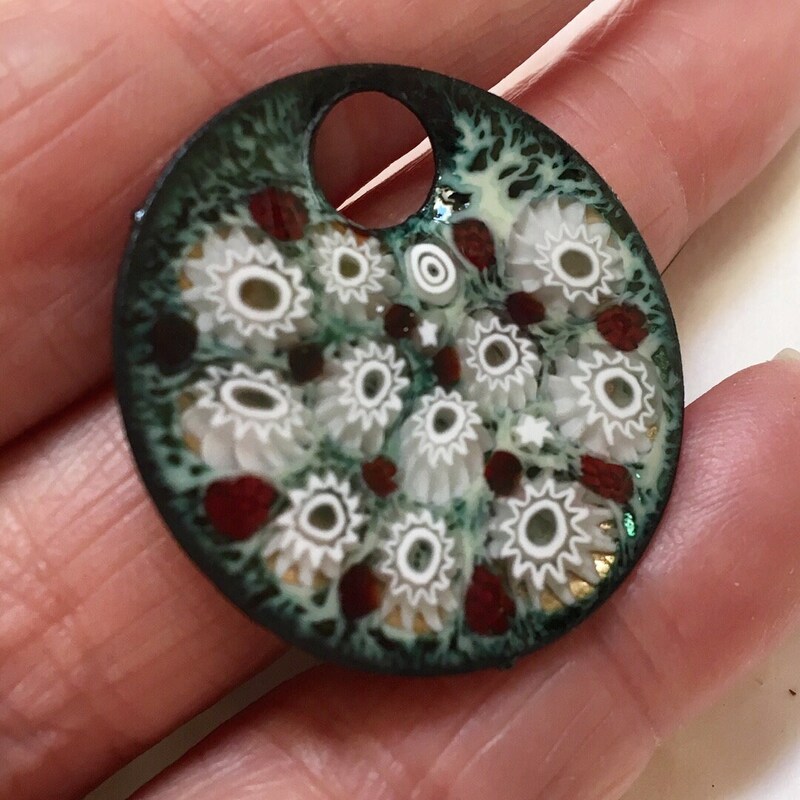 My flower inspired pendant is created as glass crumbs, powders and bits are added layer by layer to a handmade copper circle, 1 1/4” in diameter. 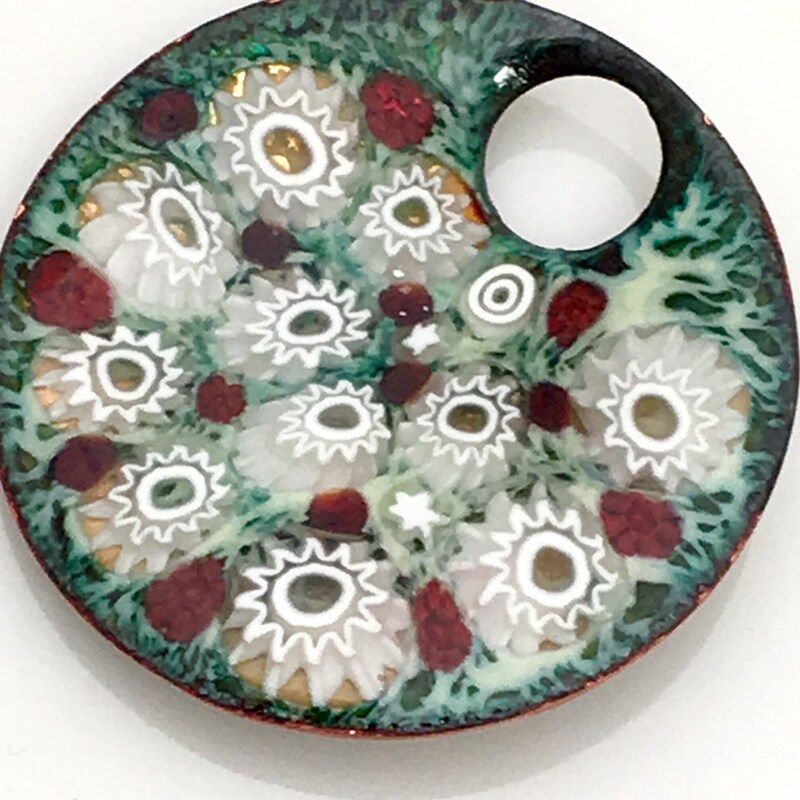 I put the piece into my kiln and fire it to 1400F to 1450 F multiple times for each layer and the glass permanently bonds the glass to the copper. Enameled pieces are durable, lightfast, waterproof and permanent with the only caveat that glass could be fractured with a strong impact. 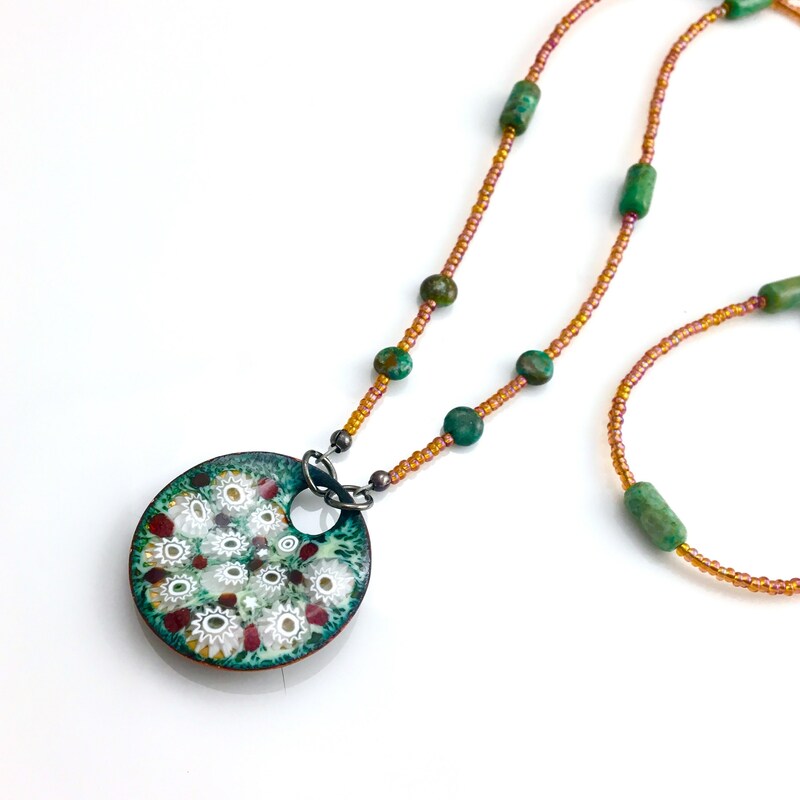 My colorful, original pendant can be worn many ways and as long or short as you like! 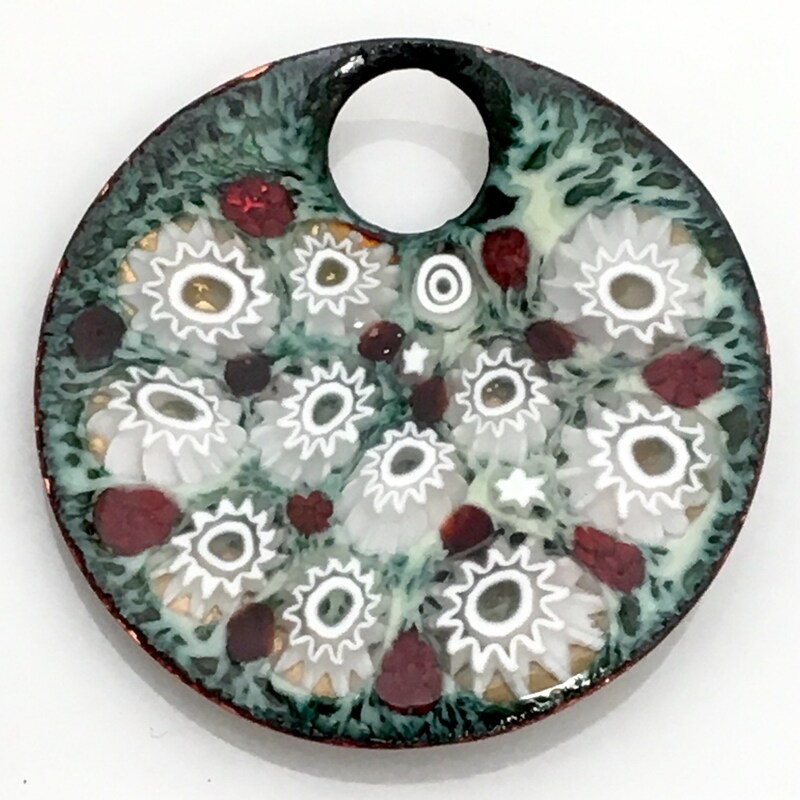 First price is for the enameled pendant alone. 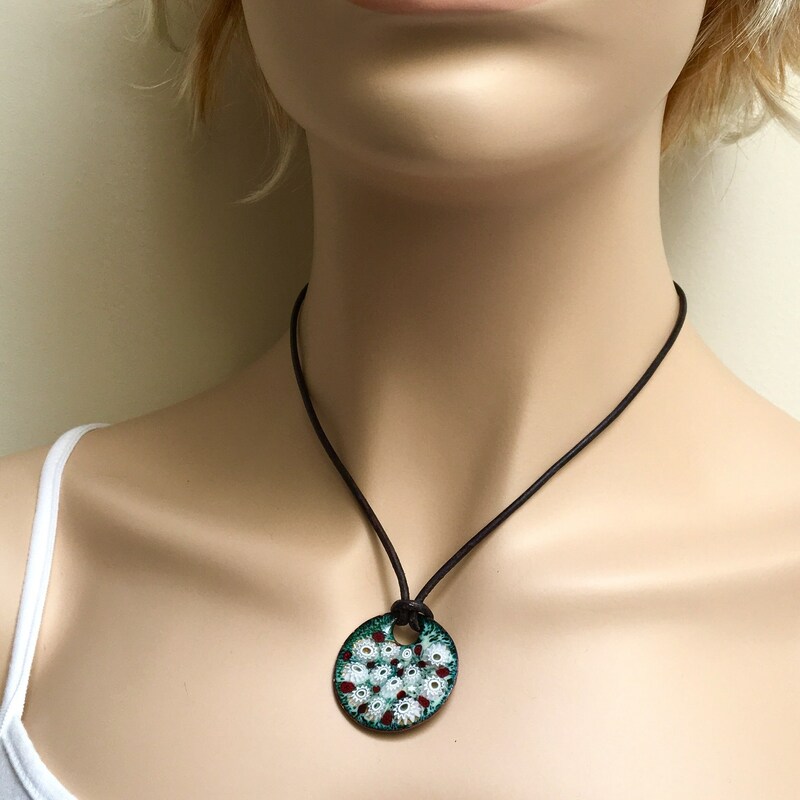 Second price is the pendant with a custom made leather cord, made to the length of your choice, finished with a brass swivel clasp & rings. 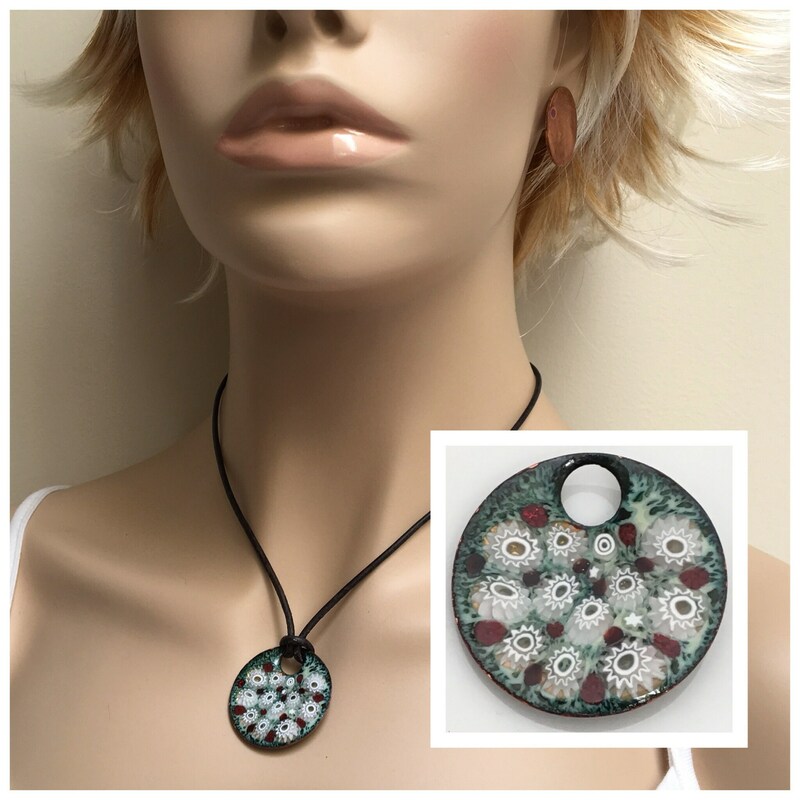 You can select a leather color & length (or let me select a leather color to best coordinate with your pendant—typically black, gray or a shade of brown.) Please add a “note to seller” while checking out with your length & preferences. 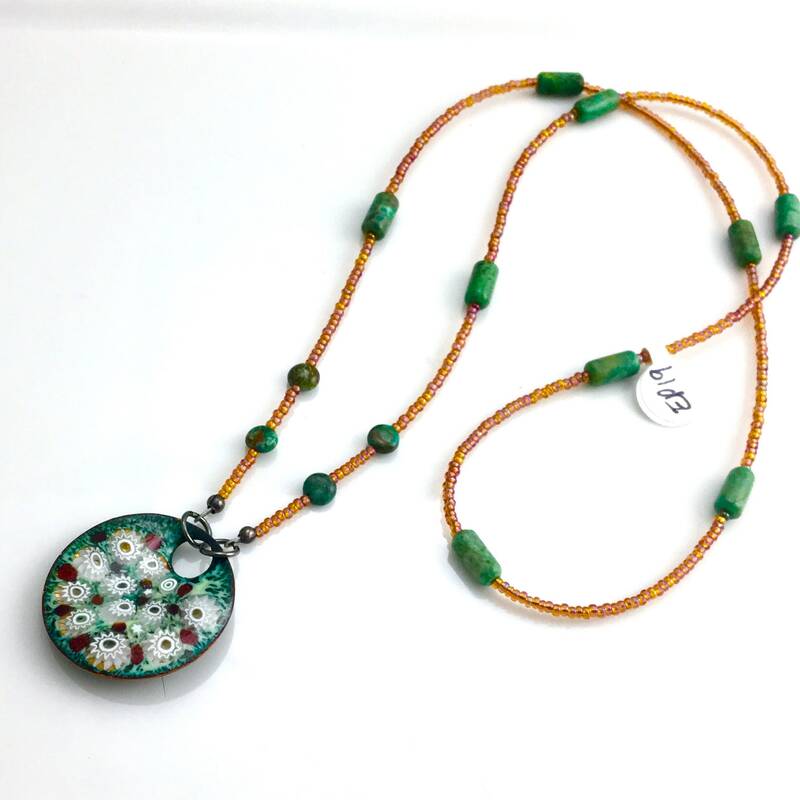 Third price is the pendant on a 25” beaded chain with green turquoise and shimmering Czech Glass seed beads in a rich amber color. Shown here on a display tray & worn with a black top. 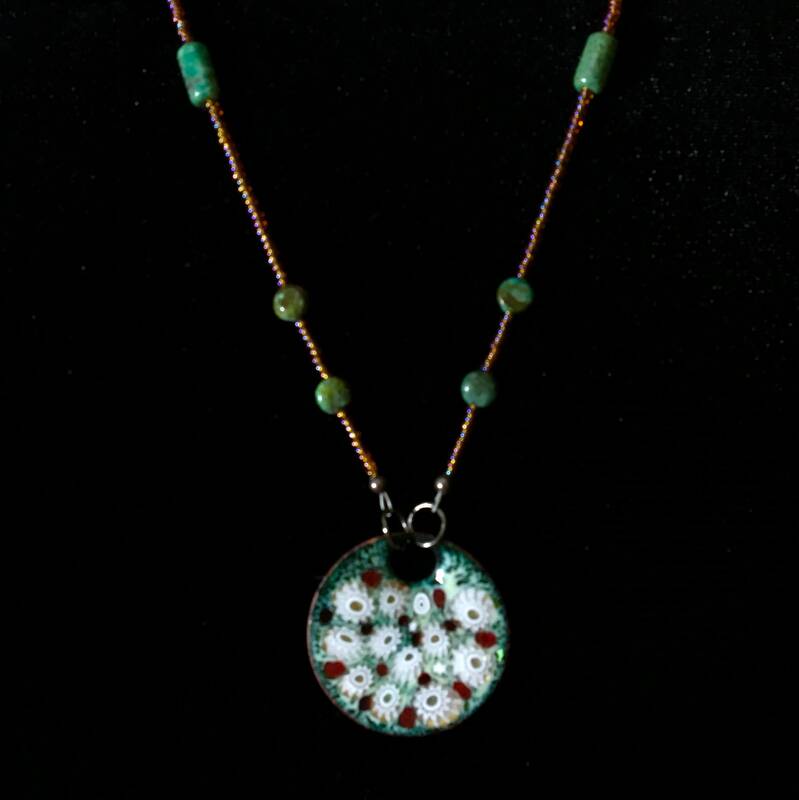 And another possibility is to contact me by convo for a custom, made to order, metal chain or beaded chain. 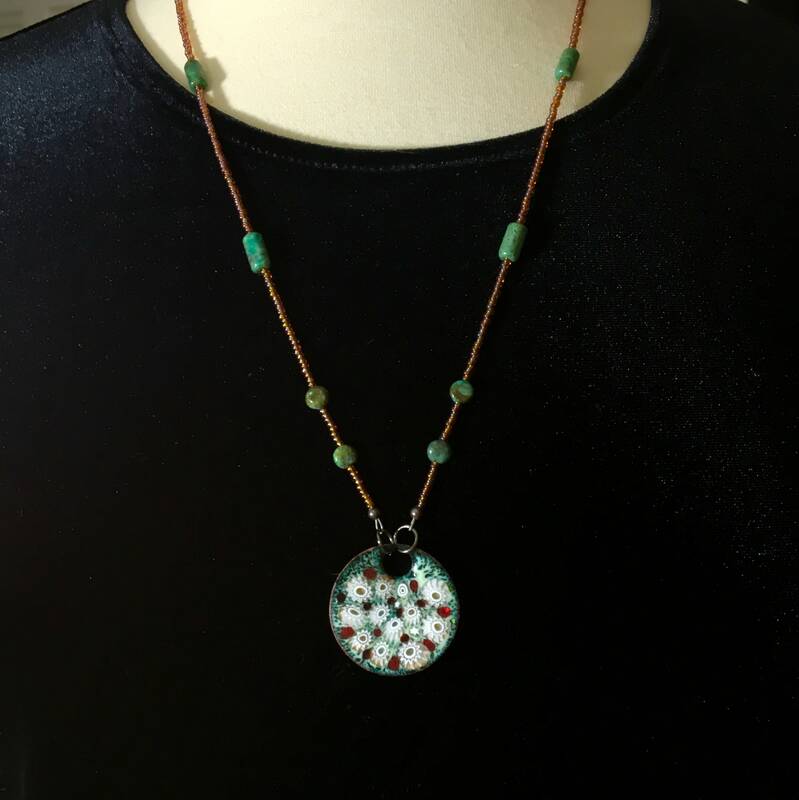 My studio is stocked with a wide selection of possibilities to further make the necklace uniquely your own!! Don’t be shy-I do a lot of custom work for many satisfied customers!